The Dark Knight campaign is slowly but surely opening up. First we got a teaser page with just a picture of the Batman logo. 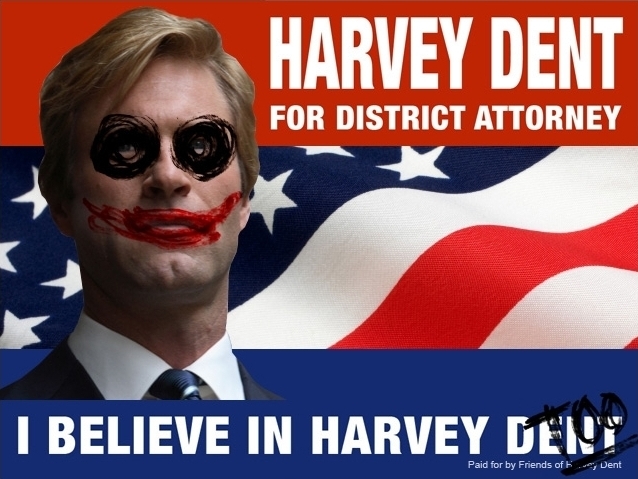 Then the picture became active, and clicking it directed you to another site: I Believe in Harvey Dent which consists of a campaign poster to elect Harvey Dent (played by Aaron Eckhart) for District Attorney. Well now we have I Believe in Harvey Dent Too, and this is where things get real interesting. I’m not quite sure what to make of it yet. No doubt they’re taking a dark approach with the film. The Joker face, and Harvey Dent for DA and the vandalized Harvey Dent photos are all T shirts @ Hot Topic, the vandalized ones being very limited edition. Have some respect, the movie isn’t even out yet. Yes, Nicholson was amazing, but Ledger was very talented too, and very professional. The new movie looks like it will be amazing, this new approach is so fascinating. A lot of people have been working on it, and I can’t wait! while im happy that Jack Nicholson was willing to play the Joker (although he did so grudgingly, demanding the most “joker-esque” of contracts, ensuring himself a royalty on any Batman movie produced thereafter- ever. this is widely considered to be the best contract ever recieved by any actor in history) i think his study of the Jokers charecter went no deeper than the Joker of the campy Adam West era. perhaps this was the direction Tim Burton wanted for the original batman movie, but looking at other Burton films, i think not. admittedly not having yet seen The Dark Knight i will have to reserve final judgement on Ledgers Joker till then, however from what little we’ve seen Ledgers character holds far more faithfully to the original Joker. If you’re unfamiliar with the original Joker from the comics of the 40’s, he is a straightfoward mass murderer, thereafter the Comics Code Authority (a Cencership board created by congress) diluted the Joker to some whimsical prankster. i guess it all boils down to preference as the Nicholson/Ledger debate has already played itself out countless times on countless forums still long before the movie is released. me, i like the original and i’m really hoping Ledger stays true to that. people need to shut up until youve seen the movie quit comparing ledger to nicholson this is a tottaly different era of films. that would be like saying ramero was better than jack just because he came first. from everything ive seen ledger looks like hes going to be great. so everyone needs to shut up and quit holding on to the past. 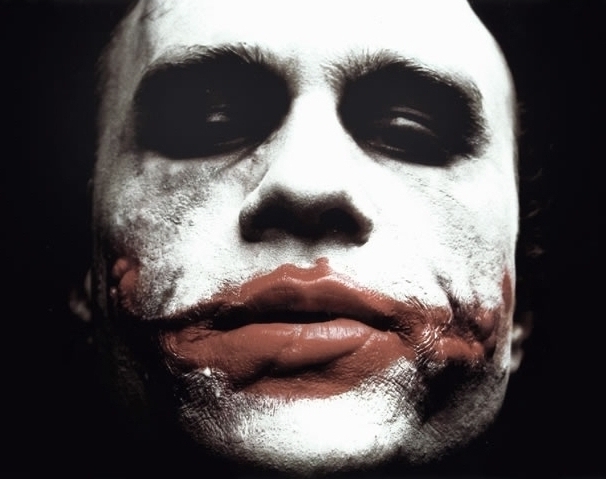 i saw the movie- ledger… wow… psychotic, really whacko… great.